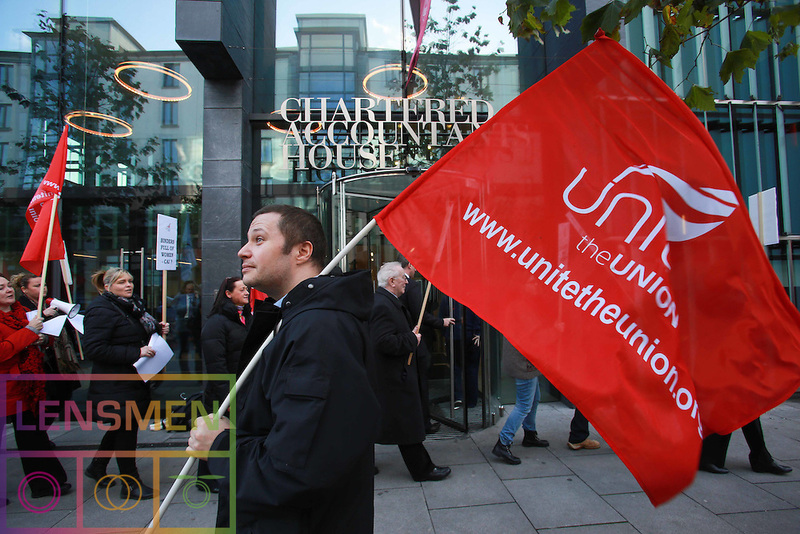 UNITE is to ask all other trade unions to question their retained auditors and accountants on their position with regard to industrial action taking place at Chartered Accountants Ireland. Regional Secretary Jimmy Kelly will bring the matter up at Wednesday's ICTU Executive meeting unless the ICAI accede to withdraw dismissal notices issued last Friday to nine members of the UNITE union at the CAI Pearse Street headquarters. "Our members are asking that process be followed and that the Labour Relations Commission be used to broker a fair resolution," said Unite Regional Officer Claire Keane. The total savings to Chartered Accountants Ireland from the redundancies will amount to €210,000, or just over half the salary package of CEO Pat Costelloe who seems determined to railroad through the changes without any care for the industrial relations mechanism of the state. Chartered Accountants Ireland is there to serve its members and those that have a relationship with the trade union sector, as well as the Labour Party will be asked to use their influence on management. Unite members voted overwhelmingly last week to take a variety of industrial action measures. Colleagues from across the financial services sector will join them at Pearse Street tomorrow at 1pm to deliver a formal invitation to enter into discussions at the LRC.